The origins of the Tarot may well have been implicit within the very first orally transmitted tales, perhaps creating even the earliest civilizations. For beneath the surface of the Tarot, a framework can be found upon which the majority of cyclic legends were formulated. The number of comparisons that can be made between the story told in the Cards of the Tarot's Major Arcana and the myths and legends of the past is remarkable. From Sumerian times and the legend of Bel (Baal) to the biblical life of Christ, the same concepts constantly repeat themselves. 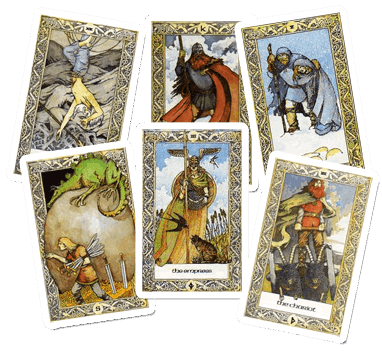 To take an example, extreme at first sight: in the present day version of the legend of Robin Hood there are many areas of close correspondence with the Tarot, but when one considers that the tales of Robin Hood had their roots in mythology, the reason at once becomes clear. Among the story-tellers of the past, the same tale was told in a multitude of forms. It was the story of a beautiful and perfect god - his name was Osiris, Mithrah, or Arthur. The story told of his life and how he was loved by all; it told of his death that was mourned by all and it told of his resurrection that would bring joy to the world. The northern poets told the story of Balder. The god of the Sun and the child of Odin. They told how he came amongst the gods of Asgard and won their hearts, the way that he was killed by the cruel treachery of Loki, and haw, after the destruction of the gods at Ragnarok, he returned to a refreshed and welcoming earth.